As a consulting CTO, I’m on the lookout for the knots in clients’ software development; untangling them has been the key to transforming chaos to clarity and making product delivery hum. As an advocate for best practices, amplified by publication of our book Managing the Unmanageable: Rules, Tools, and Insights for Managing Software People and Teams, I’m delighted to find (and become part of authoring) studies that document what makes product teams perform. It came as no surprise when The 2013 Study of Product Team Performance documented a practice endemic to product team success: how well the product manager role is defined. I’ve seen the value that good product managers bring to development teams. They talk to customers. They talk to prospects. They get insight from sales and business development. They analyze the competition. They synthesize all that complexity (and more! ), integrating it with corporate strategy, to formulate clear roadmaps that communicate both product strategy and tactics to everyone on their teams. And they collaborate with technical leaders to order the work that needs doing based on highest customer value taking into account technical factors like reducing risk, coordinating dependencies, and paying down technical debt. I don’t know how any organization can find success with its technical efforts without someone who can do all the above well. Neither do the folks on product teams. Last year’s Study of Product Team Performance revealed five factors that, when weak or missing, almost guarantees low product team performance, but when all are delivered give teams a two-out-of-three likelihood of high performance. The question: How do you define the role of a product manager in your organization? This year’s study revealed this sixth success factor: product managers, working in well-defined product management roles. The good news is that 60 percent of respondents believe the role of the product manager is well defined in their organizations. 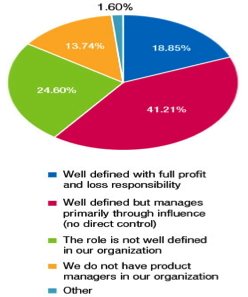 The bad news is that a quarter told us that product manager roles in their organizations were not well defined. Worse, a sixth told us they have no product managers at all.